Can you confirm these amateur observations of Matoatoa brevipes? Type locality: Ambolisatra, Madagascar [probably today’s Ambolisaka, 10 km SE of Morombe, Toliara Province]. Diagnosis Diagnosis (genus): Phyllodactyle gekkonines that have second ceratobranchials; fused nasals bones; pre cloacal pores in males; rugose or ornamented snout bones (premaxillae, maxillae, nasals, prefrontals, anterior frontal) strongly adhering to overlying skin; smooth postorbital skull bones not strongly adherent to overlying skin; homogeneous, flattened, smooth body scales arranged in parallel transverse rings; nonimbricate ventral scales; adhesive tail tip in which scansorial scales are not differentiated into distinct ventral pad, but rather consist of pilose scales of-normal size and shape that nearly or completely encircle tail tip. Comment Listed as synonym of Phyllodactylus porphyreus porphyreus by WERMUTH 1965 (who cites ANGEL 1942 and GUIBÉ 1956 as sources). SVL up to 40 mm. Type Species: Phyllodactylus brevipes MOCQUARD 1900 is the type species of the genus Matoatoa NUSSBAUM, RAXWORTHY & PRONK 1998. Definition. Matoatoa is distinguishable from all other geckos based on the following combination of characters: size moderate (40–58 mm max. 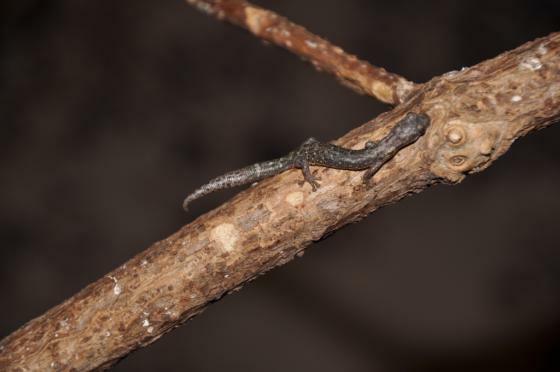 SVL), with a narrow head, a long, tubular body, unusually short limbs and long neck, and round, thick, tapering, prehensile tail with scansorial scales encircling the tip but no subcaudal pad. Dig- its are free and bear a single pair of dilated terminal adhesive pads (‘leaf toes’); claws present on all digits. Body scalation consists of flat, beadlike granules arranged in transverse rings. Preanal pores are present; 1–3 cloacal spurs are present. The eye bears a vertical pupil with cre- nate margins. The skull displays prominent co-ossification with the overlying skin, especially on the nasals. Nasals are fused; frontal single; parietal paired; stapes imperfo- rate; 14 scleral ossicles; 11 premaxillary and approxi- mately 30 dentary teeth; hyoid with second ceratobranchial cartilages. There are 26 presacral verte- brae and one pair of very small cloacal bones. The phalan- geal formula is 2-3-4-5-3 (manus)/2-3-4-5-4 (pes); paraphalangeal elements are absent. Matoatoa brevipes exhibits the following non-homoplastic apomorphic characters: raised sculpturing of der- mal bones (11-2, Fig. 10); broad contact between prefrontal and nasal (85-2, Fig. 10); postorbitofrontal fora- men present (94-0, Fig. 10); basipterygoid process not expanded distally (261-1, Fig. 20); bulge of anterior ampulla on brain case wall approaches the crista alaris (284-1, Fig. 15); posterior marginal teeth strongly tapering and pointed (not peg-like) (385-1). Habitat: dry, open, spiny forests, generally on sandy coastal soils. Also in more mesic, denser forests near boies of water. Often found inside hollow, dead branches of standing trees. Etymology Etymology (genus): Named after the Malagasy word “matoatoa” meaning ghost, in reference to the elusive, mysterious, and secretive nature of the two species. Etymology: Named after Latin “brevis, -e” = short and “pes, pedis” = foot.